At Metro Management we believe that every aspect of property management must be conducted with the highest quality standards. Metro Management Development, Inc.'s working Principal, David Baron has nearly 25 years experience in the field of cooperative, condominium and residential housing. 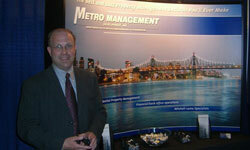 Metro presently manages over 20,000 units throughout New York City and Long Island. Metro has earned a solid reputation for delivering the highest standards in residential property management. We are known for our extensive experience, our attention to detail, and our unsurpassed level of customer service. Our property managers are among the best in the industry. They join Metro with exceptional experience and proven management skills. Our back office, headed by Metro’s Director of Finance, Victor Fuerst, possesses the technical ability to analyze any financial matter, with state of the art computerized record keeping, and advanced financial reporting systems. We provide comprehensive monthly financial reports that summarize a building's revenues and expenditures against its budget, immediately alerting the reader to any variances.